When I began watching the Global Revolution Livestream channel this past September, I experienced a rush of feelings that I hadn’t felt in years: optimism for the possibility of real social change, acceptance of controversial opinions, joy in learning I wasn’t alone in my frustration, and strength in numbers. Those people in Zuccotti Park—mostly younger than me, and more technologically savvy—were giving exposure to concerns seldom seen on TV or in most newspapers. They refused to accept the notion that corporations are people. They refused to sit idly by while Wall Street corruption widened the gaping chasm between the super-rich and the rest of humanity. And they refused to condone their country’s aggressive and destructive engagement in unnecessary wars. Much like the Greens. In those Livestream chat sessions, the Oc­cupy Wall Street moderators repeated a mantra to guide the conversation: NO CAN­DIDATES. Many in those chats were Ron Paul supporters, and many were Obama defenders, but the moderators discouraged any campaigning. Want to talk about end­ing the Fed? Fine. Want to suggest that we tax Wall Street trades? Okay. But never mention a candidate’s name. This refusal to discuss candidates helped those online debates adhere to ideas for systemic change, and suggestions for action. It was the polar opposite of the frame that mainstream media creates for partisan politics; in the 24-hour news cycle, partisan bickering becomes a blow-by-blow sporting match, with Red Man scoring X number of political points for pushing emotional buttons while Blue Man appeals to his traditional party base by reaching out to certain reliable special-interest groups. The Occupy conversations wasted no time on the gameplay between the entrenched, seemingly intractable Democrat and Re­publican poster children. They spoke more deeply to the kinds of radical change we wanted to see if parties and politicians were not in the picture at all. The inspired, inspiring people in the en­campments talked about their exasperation at the sclerotic nature of the Ameri­can two-party system. In a refreshing twist, the dialogue did not smell of liberal guilt, conciliatory hand-wringing and compromise. Debates were incisive and fearless. 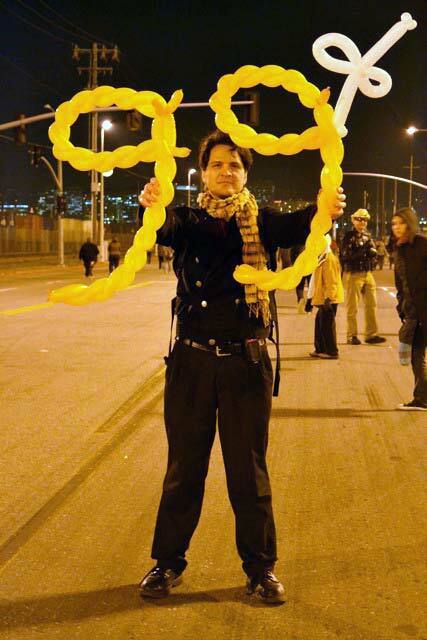 The consensus emerging in Zuccotti Park (and in Troy Davis Park, Oscar Grant Plaza, and thousands of other public spaces) seemed to be that the red-blue, Demo­pub­lican turf war was merely a distraction. The left-right orientation was itself a false paradigm. CNN, MSNBC and Fox News all peddled a sophisticated update on the old Roman bread and circuses. The donkey-and-elephant tennis match was a ruse to make us plebes feel involved, and to prevent us from voicing deeper objections. The relevant power structures were not on C-SPAN or in the public record. They were in corporate back rooms and boardrooms, in the unaccountable global chicanery of the IMF and the WTO, and in the greased palms of war profiteers. Occu­pi­ers don’t repeat “NO CANDIDATES” be­cause they are tired of sloganeering and campaigns; they feel that candidates and elected officials are all impotent pawns in fraudulent, invalid institutions. Occupiers, on the whole, also suspect that attempts at Reform are a waste of energy. For those of us who refuse to believe that Reform and Revolution are mutually ex­clusive, the “NO CANDIDATES” mantra poses some obstacles. One challenge is in advocating the idea that “NO CANDIDATES” does not equal “NO VOTING.” If the left-right paradigm should be re­placed with a bottom-up worldview, then those local-issue decisions present chances for at least a few crumbs of representation. If elections are stolen, there is no way of proving election fraud without having dissenting votes cast. Many in the Occupy movement embrace a philosophy of “Nothing short of Revo­lution.” The reasoning behind this philosophy makes sense. Forty years ago, the Democratic Party co-opted many Amer­ican revolutionaries. Four years ago, the Obama campaign co-opted the anti-war protest movement. Of course, most hopes that Big O would bring Reform vanished the moment he named Tim Geithner to his cabinet. Many of his younger, more radical supporters were heartbroken, and ready to abandon any and all faith in the U.S. system of governance. The answer is to join them. Occupy. Help shape the conversation. Listen to them. 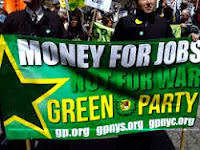 The Green ideals and the goals of most Occupiers are remarkably aligned. We all want economic justice, an end to corporate personhood, and a reduction in the amount of control big business exerts over our government. You are the 99%. 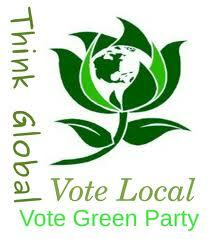 As a Green, you are more radical than you might think. Reach out and invest your time. Occupy is leaderless and horizontal; the sooner you add your voice to the mix, the sooner you will hear your views honored and represented. Your town, or the town down the road, has an Occupation—even if it does not have an encampment. The energy of this phenomenon is too great to ignore. If you are a natural leader, prepare to humble yourself. If you tend to be quieter and more passive, prepare to step up and act more like a leader. This is a new idea for those unaccustomed to the idea of horizontal organizing: it works brilliantly when people can find more equal footing. As an Occupier, I believe that part of the movement’s success is its ability to take on the properties of water. It can fill and overflow any container that tries to hold it; it can saturate any porous surface; it flows in the direction that gravity pulls it; the molecules attract one another; the surface tension helps it resist breaking. Water also moves to equilibrium by distributing heat: in Occupy, hot heads are ad­vised to chill out, while those with cooler heels find encouragement in stomping their feet to get the blood flowing. Just imagine the difference you could make by adding your pitcher of Green to the water supply of your local Occupy. This is a transformative moment in global culture. 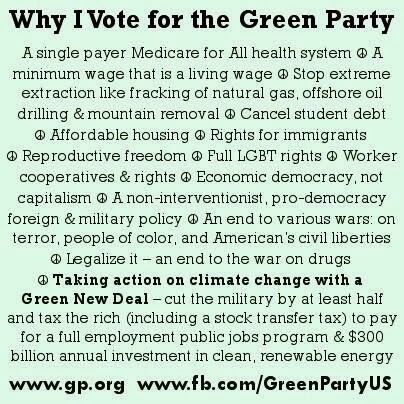 Here in the U.S., the Green Party can be deeply engaged in this transformation, but only if its members take part, and occupy the moment.